A reader finds an HCN artifact on a rafting trip. Here in Colorado, the drought is becoming more pronounced with each passing day. As we go to press, fire restrictions are in place in most of the state, and thousands have been evacuated from a major wildfire outside Durango, 150 miles south of us, where the San Juan National Forest has been closed for the first time ever. In Paonia, where High Country News headquarters is located, we’re desperately waiting for the summer rains. Luckily, we’re all multitaskers, so while we ponder the future of the West’s water, we’ve also been working. At the beginning of June, Editor-in-Chief Brian Calvert traveled to Denver to participate in a panel organized by the U.S. Forest Service to discuss the role of media and its relationship to federal agencies and their work. Also in June, HCN correspondent Joshua Zaffos met with 16 students from Concordia College in Minnesota, who were traveling through Colorado while visiting eight national parks on a nature and culture program. Josh was one of several writers and artists who met with the students to explain how the American West’s landscape plays a role in today’s culture. The warm spring days have brought visitors, including longtime subscriber Dan Aiken. Dan, a retired geologist, teaches at the Tohono O’odham Community College in southern Arizona. Some of his students traveled to North Dakota to support the Standing Rock Sioux last year, and he was happy to see HCN’s coverage of the protests. At the end of May, faithful reader Bill Mulvey came all the way from Apex, North Carolina. Bill, a just-retired high school teacher and librarian, was three weeks into a four-week road trip when he dropped by. He says HCN is a good way to keep up with what’s happening in the West. Thanks, Bill! When our readers aren’t saying hello in person, they send us emails and letters. This month we got one that made us all smile. 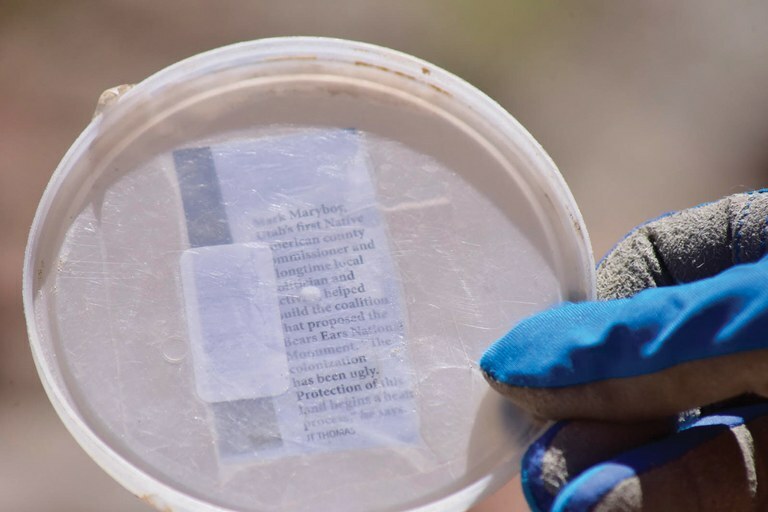 David Schaller wrote to let us know that on a recent rafting trip down the San Juan River, he found an HCN photo caption taped to a plastic disc, from our coverage of the shrunken Bears Ears National Monument. “Thanks for printing that Bears Ears story that someone read, brought to the river, shared with colleagues, and then lost for us to find,” he wrote, adding that he’d like for us to find out where it came from. So, a challenge for our friends: Look at the picture below, and write in if you know more! Help solve the mystery of the HCN photo caption. Meanwhile, just a reminder that we are taking our summer print break after this issue. Look for issue 50.12 on July 23. In the meantime, you can find new stories online at hcn.org. On a final note, one correction: In “Who can adopt a Native child?” (HCN, 4/30/18), we incorrectly state that the adoptive parents in the Baby Veronica case are from California; they are from South Carolina.